For three weeks now Party Day by Laurie Berkner has been sitting in the top 5 in the Kids' section of the Barnes and Noble Nook store. Laurie is not only an author, but also a successful children's recording artist. I contacted Laurie to find more about her successful book. Let's find out first what your book is about. Party Day is based on the title track from The Laurie Berkner Band’s 2011 DVD, Party Day! (Two Tomatoes Records/Razor & Tie). 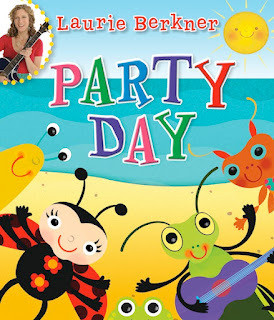 In Party Day, a merry bunch of insects get together for an all-day beach celebration. They play instruments, dance, build sand castles, tell stories and watch the waves until the sun goes down. Julia Woolf's colorful and fun illustrations made it easy to capture visually what I wanted to express in the song; the joy of being with friends and never wanting a perfect day to end. I had previously released two book-with-CDs on Scholastic’s Orchard Books imprint, both of which were based on a single song. The first was in 2004; the second in 2007. Barnes & Noble gets a strong response with their e-newsletter and they have featured it prominently on their website. The person in our office who handles social media has done a great job of getting the word out on Facebook. Our audience is mostly preschool through kindergarten. The e-format in this case works well for them because they don’t need to know how to read yet and it is easy to manipulate. Even very young children can use their fingers to play music and animations, as well as participate in fun “drag and drop” and “find and touch” activities. The full song with lyrics is also included, which enhances the experience. The book is not available in print format. The DVD came first, and then Barnes & Noble expressed interest in turning the title track into an exclusive NOOK Kids e-book. Party Day is both NOOK Kids’ and my first-ever original NOOK Kids Read and Play™ book. Learn more about Laurie and the Laurie Berkner Band at her website, her Facebook page and her blog. This week's Kids' Ebook Bestseller List features at least six authors that we haven't seen before. Exciting! Check it out for all the lastest top tens for children and young adults! The Year We Disappeared Appeared in the Top Ten!